Whether your pet is the weeniest hamster or the hugest horse, we recognise how important your pet is. And, we speak from experience because we have three dogs, two guinea pigs, two rabbits, some chickens and a leopard gecko. 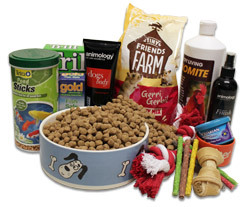 We offer a comprehensive range of food, and specialise in natural pet foods and treats. Come and see what we have. In addition, we have a comprehensive range of wild bird seeds, nuts and other nutritious foods. Feeders are also in stock – including the squirrel proof varieties – and we can also provide bird tables. Available bagged from 500g all the way to 25kg sacks, you can attract a wide variety of winged visitors. We also enjoy hearing what new birds have visited your feeders…. Don’t forget about our free local delivery service!